Counterfeiting coins and currency has been a problem for both the government and the numismatic industry. Government has shown it will go to extensive lengths in order to change the $100 note in order to stop currency counterfeiting. In fact, currency has had a long history of trying to fight currency counterfeiting. foreign coins. The thought is that the coins are obsolete and would not be accepted in commerce. However, when one of these “entrepreneurs” creates a fake coin that mimics a valuable rare variety, that causes a problem amongst collectors. Those who create counterfeit coins are not making “tributes,” as has been the stance of the Chinese government. They are reproducing rarities and trying to pass them as real coins. In some cases, these counterfeiters are even trying reproduce the third-party grading service slabs in order to get them past scrutiny. In the United States, Industry Council for Tangible Assets and the Gold & Silver Political Action Committee has been working to have congress update the Hobby Protection Act (15 U.S.C §§ 2101-2106) to provide for more protection to the buyer. Aside from strengthening the requirement to have copies appropriately marked and marketed, it allows for duped buyers and the government to take action against the resellers. Currently, the Hobby Protection Act only allows for action against the manufacturers and not anyone else in the supply chain. By opening the supply chain to prosecution it is hoped that it will choke off the supply. This past August, the House of Representatives passed the Collectible Coin Protection Act on a unanimous voice vote. The bill, H.R.2754, has been referred to the Senate and is currently waiting for action in the Commerce, Science & Transportation Committee. To support the law, to to senate.gov and use the pull down menu in the upper-right corner of the page to select the state you live or work. Please take the time to contact both of your senators. In fact, if they hold town hall meetings in your area, you can use that opportunity to talk with them personally. Collectible coins are not the only problem. Great Britain has been having problems since the issue of new £1 coins entering circulation starting in 2010. Even though arrests have been made, there remains an undetermined amount of counterfeit coins in circulation. Last summer, counterfeiters were arrested in Greece and Turkey for producing fake 2 Euro coins. These counterfeits look very similar to the standard 2 Euro coin with the standard Greece reverse. A real 2 Euro coin is a bi-metalic coin that does not separate. The counterfeits will separate and are lighter than the real version. In Canada, the Royal Canadian Mint has changed the Loonie and Toonie to include micro engraving to thwart counterfeiters. The RCM has also changed the composition of the coins which will help them last longer. Counterfeit coins and currency will continue to be a problem. Every change, no matter how small, is not only good for the economy, it is good for the hobby. Images of the new Loonie and Toonie courtesy of the Royal Canadian Mint. Foggia, Italy—A truck in southern Italy carrying €2 million in one and two euro coins crashed and spilled its load on the highway. Feeling they hit the jackpot, drivers stopped and started to scoop up the coins. On the scene, it was estimated that €10,000 was taken. A later count upped that estimate to €50,000. No arrests were reported. Driver of the truck and the two cars in the accident were not seriously injured, but they were not the focus of many of the stories. 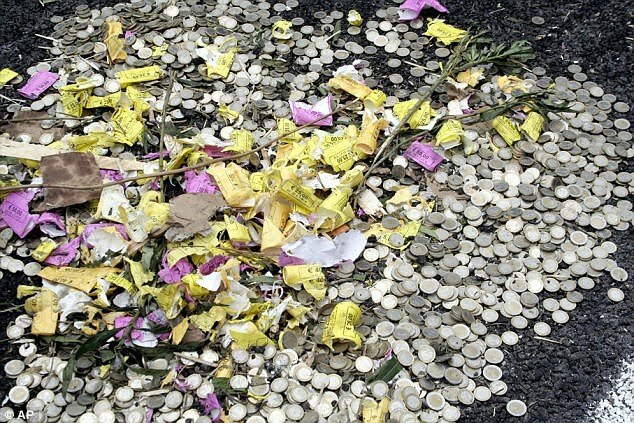 With coins strewn on the roadway and the median, the company responsible for the transport of the coins will be spending the next few days trying to sweep up the coins that motorists did not take. 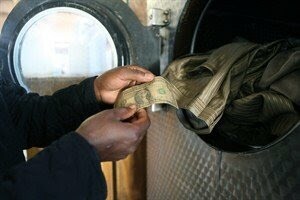 Zimbabwe—In a country where runaway inflation caused their currency to become worthless and the government made U.S. currency legal tender, Zimbabweans are washing their U.S. dollars so that they can be used. In this poor country, low-denomination U.S notes are used until they fall apart. But in order to protect currency in crime-ridden areas, notes are carried in shoes or underwear. The obvious sanitary and malodorous issues has made it a problem causing banks and many merchants to refuse to take currency that is dirty and smelly. Some people gently hand-wash their notes and some laundry services have discovered that they can wash notes in the gentle cycle then hang the notes to dry. Apparently this works for the poor in Zimbabwe since the notes outlive the Bureau of Engraving and Printing’s estimated life span of a $1 Federal Reserve Note of 20-months. Vienna—Spanish gold dealer Oro Direct S.L.U. bought the world’s largest gold coin at auction for &euro3.27 million (approximately $4.02 million). The 100 kilogram coin with a face value of C$1 million was made by the Royal Canadian Mint in 2007. This coin currently holds the world’s record for being the largest coin ever made. Gold was trading at $1,253.55 per troy ounce in London at the time of the auction. Images from Italy and Zimbabwe are courtesy of the AP. 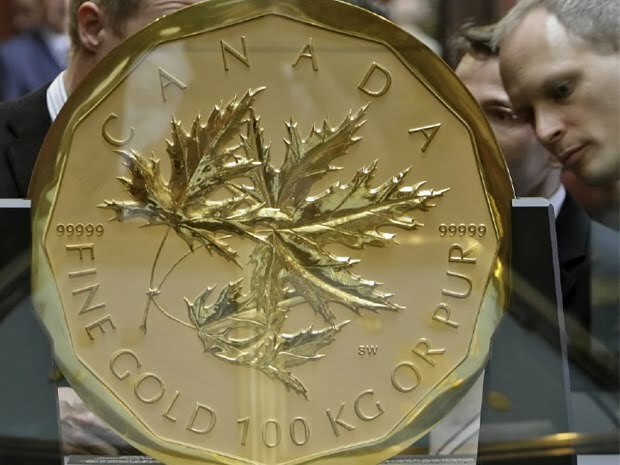 Image of the C$1 Million Maple Leaf courtesy of Reuters. On the eleventh hour of the eleventh day of the eleventh month in 1918, the war to end all wars ended. It is celebrated around the world as Armistice Day or Remembrance Sunday. In the United States, a law was passed in 1954 to honor all veterans on November 11 of every year. In Canada, the Royal Canadian Mint has reissued the Poppy Circulating Quarter to honor the 90th anniversary of the end of World War I. The poppy became popular in Canada when mentioned in a poem by Canadian Medical Director John McRae in the lime-rich fields of Belgium. RCM has been distributing these quarters through retail outlets throughout the country along with providing special collectibles on their website. One dollar from the sale of each 2008 Limited Edition Poppy Bookmark will be donated to the Legion’s Dominion Command Poppy Trust Fund, which provides financial aid to Canada’s veterans. To the veterans of the War to End All Wars and every wars since, thank you for your service to our country! Image courtesy of the Royal Canadian Mint. Apparently, the United States is not the only country with a cost problem of its lowest denomination coin. In Canada, the press obtained notes from meetings with the Bank of Canada under the Access to Information Act (a similar law to the US Freedom of Information Act) that shows the Canadian cent costs more than one-cent to produce. The Canadian cent weighs 2.35 grams and is made from .940 steel, .045 copper, and .015 nickel whose costs are subject to market conditions as any other item made from metals. As the economy changes, not only do the costs of materials change, but the costs of doing business changes. While the Royal Canadian Mint has said that the cent costs .008 to produce, reports based on the newly released documents show that the claim is based on the cost of metals and not production costs. Accounting for labor and transportation costs from December, 2007, when the report was written, it is estimated that the Canadian cent costs an estimated 1.5-cents to produce. Some Canadian politicians are up in arms over the costs and want to “do something” about this without considering that seignorage from other coins more than covers the cost. It is interesting to hear that other countries are having the same problems as we are here in the United States.